Also read: AICPIN for July 2018 – Starts Expected DA Jan 2019…! The indices of 37 centres are above All-India Index and 39 centres indices are below national average. The indices of Jalandhar and Jabalpur centres remained at par with All-India Index. At centre level, Sholapur and Bhilai reported the maximum increase of 6 points each followed by Pune, Kodarma and Godavarikhani (5 points each). Among others, 4 points increase was observed in 2 centres,3 points in 6 centres,2 points in 18 centres and 1 point in 15 centres. On the contrary, Chhindwara, Darjeeling, Jalandhar, Jaipur and Ghaziabad recorded a maximum decrease, 6f 2 points each. Among others, 1 point decrease was observed in 12 centres. Rest of the 15 centres’ indices remained stationary. The indices of 36 centres are above All-India Index and 39 centres indices are below national average. The indices of Mumbai, Jabalpur and Chhindwara centres remained at par with All-India Index. 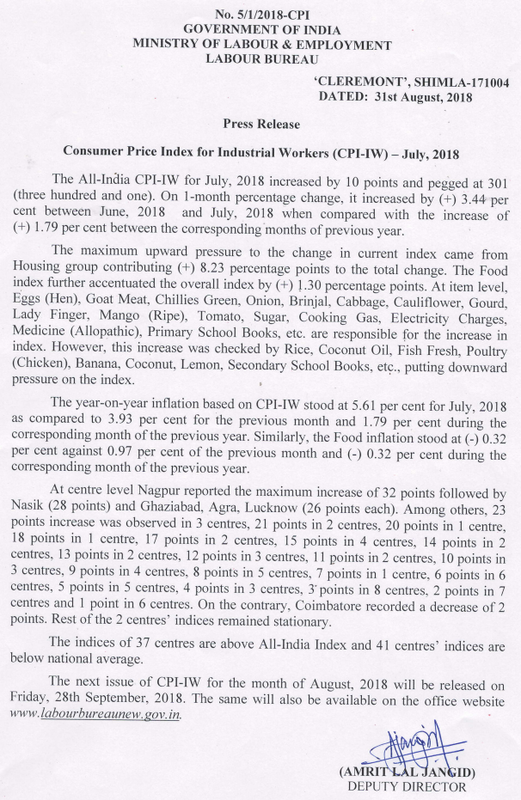 The All-India CPI-IW for April, 2018 increased by 1 point and pegged at 288 (two hundred and eighty eight). On I-month percentage change, it increased by (+) 0.35 per .cent between March, 2018 and April, 2018 when compared with the increase of (+) 0.73 per cent between the corresponding months of-previous year.